The Sikorsky MH-60G/HH-60G Pave Hawk is a twin turboshaft engine helicopter in service with the United States Air Force. It is a derivative of the UH-60 Black Hawk and the US Air Force PAVE electronic systems program. The HH/MH-60 is a member of the Sikorsky S-70 family. The MH-60G Pave Hawk's primary mission is insertion and recovery of special operations personnel, while the HH-60G Pave Hawk's core mission is recovery of personnel under stressful conditions, including search and rescue. Both versions conduct day or night operations into hostile environments. Because of its versatility, the HH-60G may also perform peace-time operations. Such tasks include civil search and rescue, emergency aeromedical evacuation (MEDEVAC), disaster relief, international aid, counter-drug activities and NASA space shuttle support. In 1981, the U.S. Air Force chose the UH-60A Black Hawk to replace its HH-3E Jolly Green Giant helicopters. After acquiring some UH-60s, the Air Force began upgrading each with an air refueling probe, and additional fuel tanks in the cabin. The machine guns were changed from .308 in (7.62 mm) M60s to 0.50 in (12.7 mm) XM218s. These helicopters were referred to as "Credible Hawks" and entered service in 1987. Afterwards the Credible Hawks and new UH-60As were upgraded and designated MH-60G Pave Hawk. These upgrades were to be done in a two step process. But funding only allowed 16 Credible Hawks to receive the second step equipment. These helicopters were allocated to special operations use. The remaining 82 Credible Hawks received the first step upgrade equipment and were used for combat search and rescue. 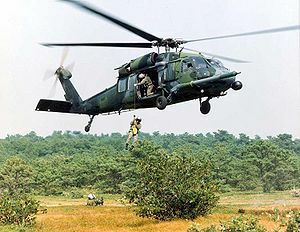 In 1991, the search and rescue Pave Hawks were redesignated HH-60G. The Pave Hawk is a highly-modified version of the Sikorsky UH-60 Black Hawk. It features an upgraded communications and navigation suite that includes an integrated inertial navigation/global positioning/Doppler navigation systems, satellite communications, secure voice, and Have Quick communications. Pave Hawk combat enhancements include a radar warning receiver, infrared jammer and a flare/chaff countermeasure dispensing system. HH-60G rescue equipment includes a hoist capable of lifting a 600 pound (270 kg) load from a hover height of 200 feet (60 m), and a personnel locating system. A limited number of Pave Hawks are equipped with an over-the-horizon tactical data receiver that is capable of receiving near real-time mission update information. Picture - USAF HC-130P of the 920th Rescue Wing refuels an HH-60 Pave Hawk. The U.S. Air Force HH-60G Pave Hawk is operated by the Air Combat Command (ACC), U.S. Air Forces in Europe (USAFE), Pacific Air Forces (PACAF), Air Education and Training Command (AETC), the Air Force Reserve Command (AFRC) and the Air National Guard (ANG). All MH-60Gs subsequently divested by AFSOC, redesignated as HH-60Gs in 1991 and transferred back to Air Combat Command (ACC) and ACC-gained Air Force Reserve Command (AFRC) and Air National Guard (ANG) units. Picture - Sri Lankan relief workers unload vegetables from an HH-60G during an Operation Unified Assistance mission. Pave Hawks have regularly operated in Operation Enduring Freedom and Operation Iraqi Freedom supporting Army and Marine Corps ground combat operations and standby search and rescue support for U.S. and Coalition fixed-wing combat aircraft supporting those ground operations. In March 2010, the U.S. Air Force announced a recapitalization plan to return its 99-aircraft inventory to 112 airframes by incremental replacement aging HH-60Gs. A secondary plan for loss replacement of thirteen attrited HH-60s, seven of which have been lost in combat since 2001, has begun implementation. The Air Force is deferring secondary combat search and rescue requirements that called for a larger helicopter. A UH-60M-based version was being offered as a replacement. HH-60H Rescue Hawk: Special Operations, search and rescue model for the US Navy. Equipped with long-range fuel tanks, FLIR, improved radar, and 2 BRU auxiliary fuel/armament racks allowing the addition of external fuel tanks and the Hellfire guided weapons system. HH-60M : a search and rescue version of UH-60M with a glass cockpit and more powerful engines. HH-60P Pave Hawk : Combat Search and Rescue variant of UH-60P, in service with Republic of Korea Air Force. Confirmed equipment of External Tank System and FLIR for night operations. United States - 68 in Active, 15 in Reserve, and 18 in Air National Guard. Republic of Korea Air Force - 6th Combat Control Team/Combat Search And Rescue Group, 233rd Combat Search & Rescue Squadron.